By Samuel Dolgin-Gardner. 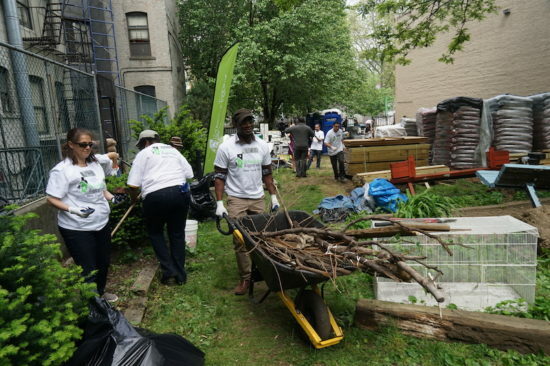 Residents and volunteers help spruce up a new community garden on 146th Street on May 19. While raising a family in Mott Haven, Wanda Swinney came to realize something important was missing in her life: green space. 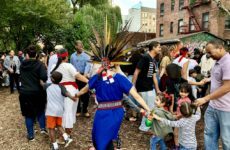 Swinney and her fellow tenants at 331 East 146th Street saw their wish for a green respite brought to life last weekend when the underused backyard of their six-story apartment building opened to the public as a community garden after decades of neglect. Around 30 volunteers from nonprofits Banana Kelly Community Improvement Assoc., Local Initiatives Support Corporation (LISC) and Rebuilding Together NYC kickstarted the two-day redesign project on May 19. More people joined in the next day, including volunteers from Deutsche Bank, which is financing the project, to put in the finishing touches. 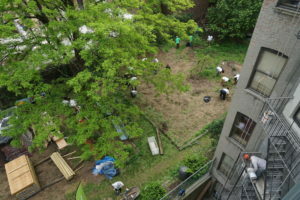 Last year, Swinney, who founded the building’s tenant association, started advocating to open the green space to the community for gardening and recreation. She contacted Banana Kelly, which owns the building, and they agreed to transform the yard into a community space. Banana Kelly enlisted help from LISC to find funding for the project. It was ultimately decided that the lot would be transformed into a community garden. Volunteers, led by Terry Scott, the director of construction at Rebuilding Together NYC, gathered in the garden on the 19th to clean it up. A team of four volunteers wearing hardhats and safety goggles chopped off wild tree branches. Others removed weeds, old rotting wood benches, leveled the ground and laid garden soil. Once the garden is up and running, produce harvested there will be sold at a local farmer’s market at affordable prices, said Colleen Flynn, director of programs of LISC NYC. She added that Banana Kelly and LISC are working toward the long-term goal of setting up a food pantry and providing cooking classes and nutrition education for the community. Banana Kelly has stipulated that the building’s residents’ council be responsible for the maintenance and upkeep of the garden, as part of the agreement. By Samuel Dolgin-Gardner. Volunteers sprucing up a new community garden in Mott Haven. 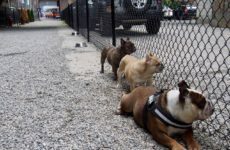 The yard is rather hidden—enclosed by apartment buildings on three sides, with only a 12-foot-wide gate on College Street. Banana Kelly had worried that it would attract drug users and gang activities because of its location. Terry Scott, the director of construction for Rebuilding Together NYC, showed a rough sketch of the garden design and said the garden would benefit all age groups. Young children will get to learn where food comes from, plant vegetables, nurture them and watch them grow. “At the end of the day, when they actually get to harvest it and prepare it in the kitchen, they get to eat the fruit of their labor,” he said. For older children, working in the garden would be an opportunity to show that they’ve got something to give back, Scott said. “They can mentor [younger children], they can be a voice and a force of change in their own world and they can affect someone’s life,” he said. Hector Cubero, 57, said he has watched the yard decay during the 21 years he has lived in the building. 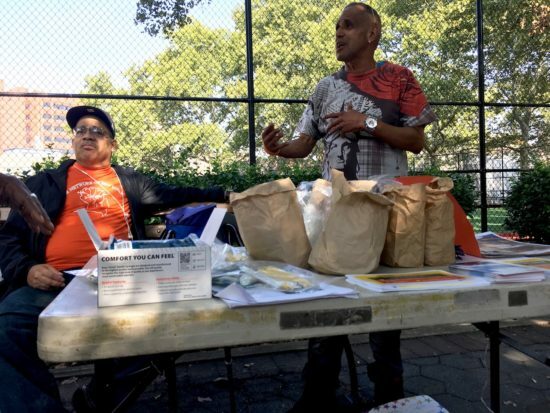 While assisting volunteers to remove a wooden stair rotting in the yard, he noted how hard it has been for tenants to get organized for a clean up. In 1999, he paid $75 out of pocket to workers to remove weeds and overgrown branches. Cubero said the Botanical Garden once helped the tenants plant some bushes and flowers in the yard in 2002, but they never returned, so the weeds grew back. “I’ve never seen the yard like this—all cleaned up,” he said. He was excited to be among the volunteers who helped cut down the overgrown branches that afternoon. Scott said seeing people take the time to work on community projects such as this one moved him.